Charsadda, Pakistan: Suicide bombers attacked a Pakistani paramilitary academy on Friday, killing 80 people in revenge for the death of Osama Bin Laden as Pakistani anger over the US raid to get the Al Qaeda leader showed no sign of abating. US special forces flew in from Afghanistan to find and kill Bin Laden at his hideout in a northern Pakistani town on May 2. Pakistan welcomed the killing of Bin Laden as a major step against militancy but was outraged by the secret US raid that got him, saying it was a violation of its sovereignty. The discovery of Bin Laden in the town of Abbottabad, near the country's top military academy, has, however, deepened suspicion in the United States that Pakistani security forces knew where he was hiding. Bin Laden's followers have vowed revenge for his death and the Pakistani Taliban said the Friday attack by two suicide bombers on a paramilitary academy in the northwestern town of Charsadda was their first taste of vengeance. "There will be more," militant spokesman Ehsanullah Ehsan said by telephone from an undisclosed location. 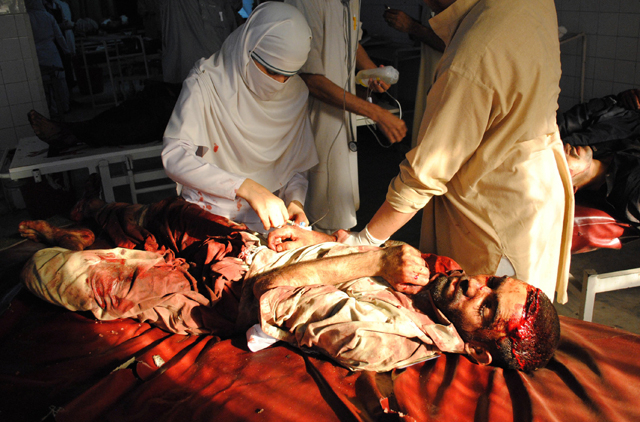 The attackers struck as the recruits were going on leave and 65 of them were among the 80 dead. Pools of blood strewn with soldiers caps and shoes lay on the road outside the academy as the wounded, looking dazed with parts of their clothes ripped away by shrapnel, were loaded into trucks. 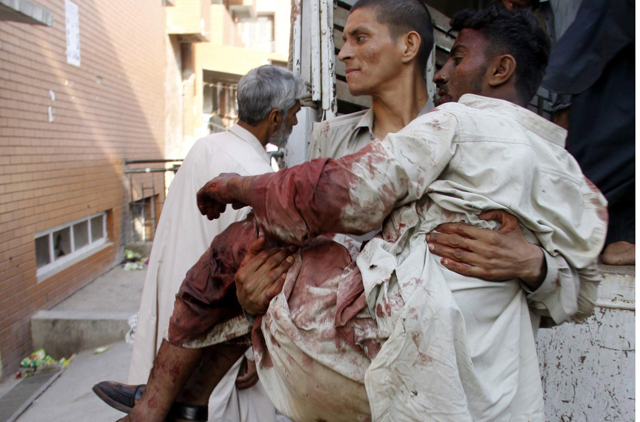 Shahid Ali, 28, was on his way to his shop when the bombs went off. He tried to help survivors. "A young boy was lying near a wrecked van asked me to take him to hospital. I got help and we got him into a vehicle," Ali said. Hours after the bombing, a US drone aircraft fired missiles at a vehicle in the North Waziristan region on the Afghan border, killing five militants, Pakistani security officials said. It was the fourth drone attack since bin Laden was killed, inflaming another sore issue between Pakistan and the United States. Pakistan officially objects to these attacks, saying they violate its sovereignty. It also says the civilians casualties complicate its efforts to fight militants by gaining the support of local villagers. The United States says the drone strikes are carried out under an agreement with Pakistan and it has made clear it will go after militants in Pakistan when it finds them. The bomb attack was a grim reminder of the militant threat Pakistan faces even as Bin Laden's discovery 50 km from the capital has revived suspicion of Pakistani double-dealing. The Pakistan Taliban, close allies of Al Qaeda, are fighting to bring down the nuclear-armed state and impose their vision of Islamist rule. They launched their war in earnest in 2007, after security forces cleared militant gunmen from a radical mosque in the capital, killing about 100 people. Pakistan has long used militants as proxies to oppose the influence of its old rival India, and is widely believed to be helping some factions even while battling others. It has rejected as absurd suggestions its security agencies might have known where Bin Laden was hiding. The United States has long pressed Pakistan to tackle Afghan Taliban taking shelter in Pakistani enclaves on the border but the chance of greater cooperation with the United States appears to have been dented by the US raid to get Bin Laden. The chairman of Pakistan's joint chiefs of staff committee, General Khalid Shameem Wynne, has cancelled a five-day visit to the United States beginning on May 22. "He called his US counterpart ... and informed him that the visit could not be undertaken under existing circumstances," a military official told Reuters. He did not elaborate but the decision to cancel the visit came as the cabinet defense committee said it was reviewing cooperation with the United States on counter-terrorism. The parameters of such cooperation would be clearly defined "in accordance with Pakistan's national interests and the aspirations of the people", the committee said in a statement. The military and government have also come in for criticism at home, partly for failing to find Bin Laden but more for failing to detect or stop the unauthorised US raid to kill him. Army chief General Ashfaq Kayani will be at a closed-door briefing by military officials to parliament later on Friday. Some US lawmakers have called for suspending aid to Pakistan because of doubts about its commitment in going after violent Islamists. But President Barack Obama's administration has stressed the importance of maintaining cooperation with Pakistan in the interests of battling militancy and bringing stability to neighbouring Afghanistan. Meanwhile, Britain has condemned the "cowardly" double suicide bombing at the paramilitary police training centre in Pakistan. Foreign Secretary William Hague also pledged support for Islamabad after the blasts in Shabqadar, northwest Pakistan. "These attacks were cowardly and indiscriminate, killing many innocent bystanders and targeting those who serve to protect Pakistan," British Foreign Secretary William Hague said in a statement. "They prove once again that such extremist groups have no regard for the value of human life." Hague added: "The UK is committed to standing with Pakistan in the fight against violent extremism and we will continue to work with Pakistan to tackle this shared threat." The pair of explosions was outside a security force training centre in northwest Pakistan. The Pakistani Taliban claimed it carried out to avenge the killing of Osama Bin Laden. 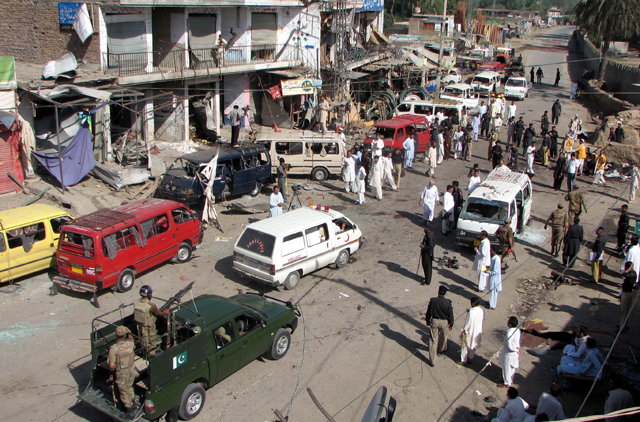 Liaqat Ali Khan said 66 victims in the attack Friday were recruits for the Frontier Corps. 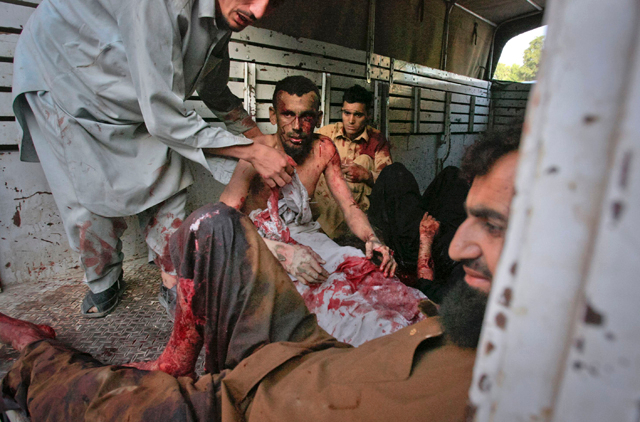 The attack is the bloodiest in Pakistan since the US raid that killed the Al Qaida chief on May 2. Ahsanullah Ahsan, a spokesman for the Pakistani Taliban, has said the attack was in retaliation for Bin Laden's death. A suicide bomber detonated at least one of the blasts at the main gate of the facility for the Frontier Constabulary, a poorly equipped but front-line force in Pakistan's battle against Al Qaida and allied Islamist groups close to the Afghan border. Like other branches of Pakistan security forces, it has received US funding. Most of the dead were recruits. The scene of the blast was littered with shards of glass mixed with blood and human flesh. The explosions destroyed at least 10 vans the recruits were boarding to go home for a short break at the end of a recent training session. Regional police officer Liaqat Ali Khan said at least 69 people died in the attack. Dr Abdul Hameed Afridi of Lady Rieding Hospital in Peshawar said 117 people have been treated at the hospital, including 40 with critical wounds. 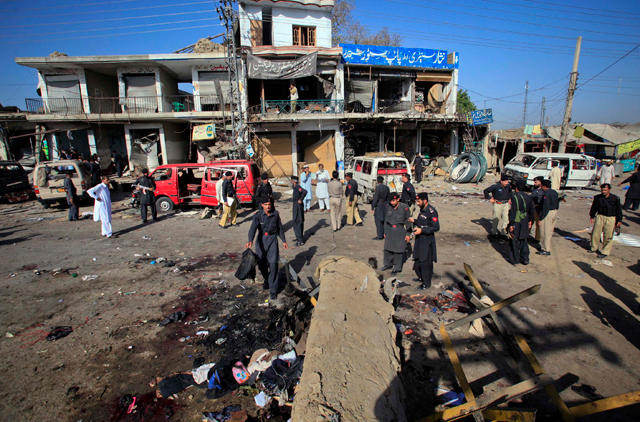 It was the bloodiest attack in Pakistan since Bin Laden's death in a May 2 US raid in the city of Abbottabad. "We have done this to avenge the Abbottabad incident," Ahsanullah Ahsan, a spokesman for the Pakistani Taliban, told The Associated Press in a phone call. "Also, the Pakistani army has failed to protect its land." About 6kg to 8kg of explosives were used in one explosion, said police officer Jahanzeb Khan. Ballbearings and nails were used in another, heightening the death toll, he said. A vegetable vendor at the site said some recruits were seated in white minivans and others were loading luggage atop the vehicles. "There was a big blast," he said. "I saw smoke, blood and body pieces all around." The attack was a savage reminder of the toll militant groups are taking on Pakistan even as it faces international suspicion that elements within its security forces may have been harbouring Bin Laden. Police official Nisar Khan said a suicide bomber in his late teens or early 20s set off one of the blasts. The cause of the other explosion was not yet known, he said. The September 11 mastermind and at least four others were killed by US Navy SEALs who raided Bin Laden's compound in Abbottabad, a garrison city not far from the capital. Bin Laden is believed to have lived in the large house for up to six years. Pakistani officials have denied knowing he was there but have criticised the American raid ordered by President Barack Obama as a violation of their country's sovereignty. Pakistani leaders have repeatedly pointed out that tens of thousands of their own citizens have died in suicide and other attacks since September 11, 2001, when Islamabad became an ally of the US in taking on Islamist extremists. 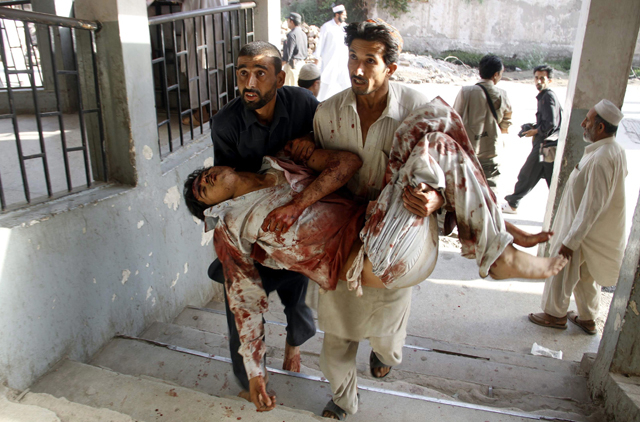 Many of the attacks in Pakistan have targeted security forces, including young cadets or recruits.